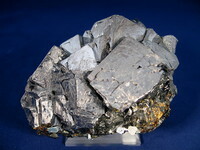 A showy example of metallic, intergrown cuboctahedral galena crystals up to 38 mm, associated with sphalerite and minor chalcopyrite. 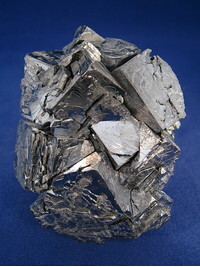 The galena crystals exhibit an interesting hoppered growth. Ex. Karel Bal Collection (2006) Specimen size = 85 x 70 x 60 mm.